Monterey, CA (August 28, 2018) – British Sports Car Hall of Fame Director and noted British vehicle book author John Nikas honored Kjell Qvale, founder of the Qvale Auto Group and co-founder of The Pebble Beach Concours d’Elegance this weekend as part of his posthumous induction into the British Sports Car Hall of Fame. 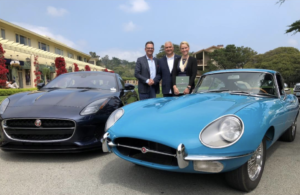 Bruce Qvale, Kjell’s son and President of the Qvale Auto Group (QAG), and his daughter Kendel Qvale, Vice-President, QAG, accepted the award for Kjell at The Lodge at Pebble Beach on the eve of the Pebble Beach Concours d’Elegance alongside Jaguars from then and now. 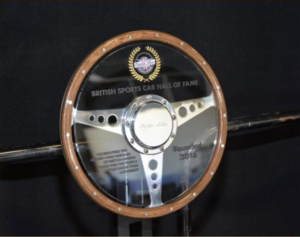 They were awarded with the coveted Moto-Lita Trophy from the British Sports Car Hall of Fame, named for the renowned wooden classic British steering wheel. Based in San Francisco since 1947, Kjell was the first importer/distributor of all British vehicles in Northern California, and shortly thereafter became the importer/distributor for the entire West Coast. Since then, Kjell and his companies have sold nearly one quarter million Jaguars, as well as countless other brands, and in fact are responsible for selling more British sports cars in North America than anyone else. Today, San Francisco-based Qvale Auto Group owns 14 dealerships across the United States, and continue to offer such distinguished brands as Jaguar, Land Rover, Aston Martin, Bentley, Rolls Royce, Bugatti, Lamborghini, Pagani, Porsche and Audi. The British Sports Car Hall of Fame, located in Petersburg VA, honors important contributors to the British sports car legacy in the United States.